This announcement (the "Announcement") is made by Mongolian Mining Corporation (In Provisional Liquidation) (the "Company", together with its subsidiaries, the "Group") pursuant to Rule 13.09(2) of the Rules Governing the Listing of Securities on The Stock Exchange of Hong Long Limited (the "Stock Exchange") and the Inside Information Provisions under Part XIVA of the Securities and Futures Ordinance (Cap. 571 of the Laws of Hong Kong). The Company wishes to inform its shareholders that it is continuing to progress negotiations with its creditors in relation to the Debt Restructuring. Since the JPLs have been appointed, the Company has been protected by a statutory moratorium from any proceedings being commenced or continued against it without the leave of the Cayman Court, leaving the Company, the Board and the JPLs free to engage in concluding a collective restructuring plan in the best interests of all of the Company's creditors, and ensure the Company and the Group's ability to continue thereafter as a going concern. In order for the JPLs to have been appointed by the Cayman Court, the Petition was required to be filed with the Cayman Court at the same time as the application seeking the appointment of JPLs. As at the date of this Announcement, no winding up order had been made against the Company. The Company intends to maximize legal protection for its shareholders by removing uncertainties associated with share transfers imposed by the Cayman Companies Law and facilitate the ongoing trading of the Shares. As such, the Company has applied and successfully obtained, for the benefit of all its shareholders, an order from the Cayman Court approving any transfer of the Shares whilst the Company is in provisional liquidation. The Company is pleased to announce that, on 7 October 2016 (Cayman time), the Cayman Court granted an order to the effect that (i) all proposed share transfers for which the Company had received requests, as of 7 October 2016, are approved and shall not be void if a winding up order is ever made against the Company, and (ii) all future transfers of full-paid Shares during the provisional liquidation of the Company are approved and shall not be void if a winding up order is made against the Company, provided that the JPLs provide their written consent to each future transfer of the Shares. As a company listed on the Stock Exchange, all of the Shares are fully paid. As such, the Company has been informed by the JPLs that they will provide such written consent to all future share transfers upon receipt of valid requests from the Company's share registrar. Accordingly, there is no impediment to the trading of the Shares. The Company will publish further announcements to update the shareholders and potential investors on the progress of the Debt Restructuring as and when necessary. October 10 -- Rio Tinto will reduce its gross debt by $1.5 billion under cash tender offers announced on 26 September 2016. As part of Rio Tinto's ongoing capital management plan, Rio Tinto Finance (USA) plc and Rio Tinto Finance (USA) Limited (each a "Company" and together, the "Companies") have made cash tender offers (the "Offer") to purchase up to approximately $1.5 billion of the outstanding securities listed in the table below (the "Securities"). The Offer, which commenced on 26 September 2016 and will expire on 24 October 2016, was oversubscribed at 5pm, New York City time, on 7 October 2016 and therefore approximately $1.5 billion of Securities will be purchased. No Securities tendered after the above time will be accepted. October 10 (MSE) Mongolian Stock Exchange organized 5 securities trading sessions and made transaction of MNT2.1 billion with daily average transaction of MNT10,357,182,289.00 in period between 03 October 2016 and 07 October 2016. 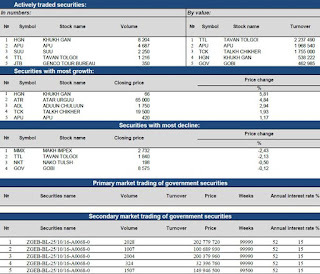 118,654.00 shares of 23 joint stock companies worth of MNT66,012,039.00 were traded. 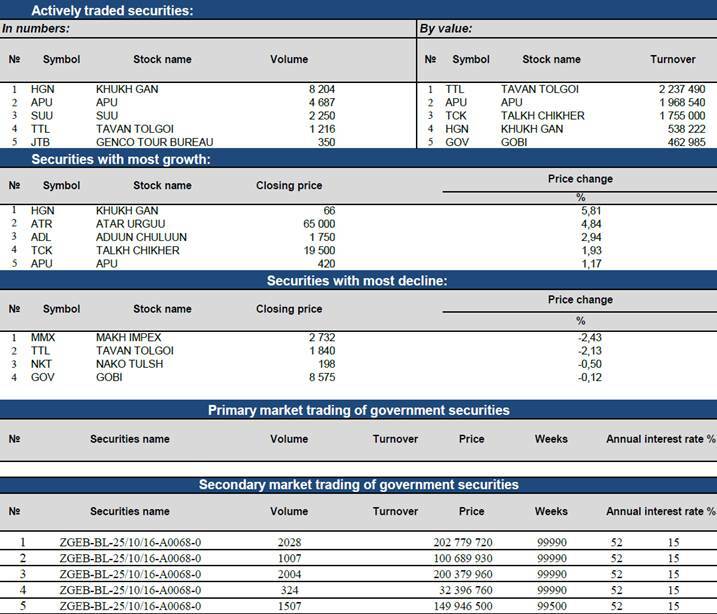 2,915 government retail bonds traded on secondary market of Government securities trading and total of 291,170,250.00 transaction has been made. As of 07 October 2016, market capitalization was MNT1,396,356,978,528.96 which indicated increased of 0.62% and MSE ALL index reached 819.85 units which indicated increased of 0.04% from the previous week. 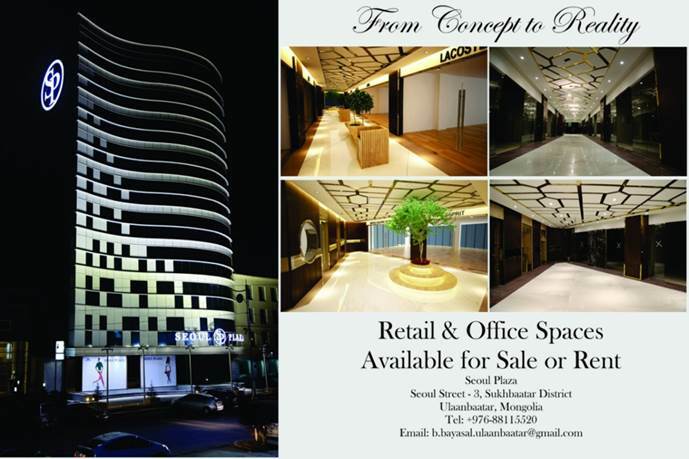 October 10 (MSE) Shareholders meeting of "Darkhan Hotel" JSC announcedby the Resolution No. : 08 of Board of Directors meeting dated on 23 September 2016. October 10 (MSE) Pursuant to the Mongolian Securities Law, the Clause No. : 20 of Listing Rule of MSE, the Resolution and the Official request No. : 1/1199 of shareholders meeting of "Thermal Power Plant II" JSC dated on 18 October 2015, and the Order No. :373 of CEO of MSE dated on 07 October 2016, total of 18,213,445 share with face value of MNT100.00 changed to total of 72,853,780 shares with face value of MNT25.00 at MSE's listing. October 10 (MSE) Pursuant to the Mongolian Securities Law, the Resolution No. : 267 of Financial Regulator Commission dated on 2016, and the Order No. : 374 of CEO of MSE dated on 7 October 2016, total of 4,324,263 shares with face value of MNT1000.00 of "I Tools" JSC delisted from MSE's listing. October 10 (MSE) Pursuant to the Mongolian Securities Law, the Resolution No. : 266 of Financial Regulatory Commission of 2016, the Order No. :375 of CEO of MSE dated on 07 October 2016, total of 9,870,287 additional issued shares with face value of MNT100.00 delisted from MSE's listing. October 10 (UB Post) The Ministry of Finance recommended the privatization of the Mongolian Stock Exchange (MSE) in their draft of the 2017 budget, proposing a 20 billion MNT price tag. Last week, Minister of Finance B.Choijilsuren stated that the government would be forced to privatize state-owned companies if operations are not improved, as a reported 70 percent of state run companies have revenue deficits. The value of the MSE was determined to be 5.45 billion MNT earlier this year, with circulating capital of 913.6 million MNT and fixed assets valued at 3.95 billion MNT. As of the first six months of 2016, the MSE had a revenue deficit of 613.2 million MNT. The revenue loss of the MSE was 956 million MNT in 2014 and 236.1 million MNT in 2015. Some economists say the reason for the decline in revenue and the increase in costs can be attributed to the Millennium Exchange system, an "ultra low-latency" trading platform that the MSE implemented in July 2012. The Ministry of Finance also recommended the privatization of five other state-owned companies. The ministry had previously recommended the privatization of the MSE back in 2014. The plan in 2014 was for the government to own 34 percent of the MSE and to offer the remaining 66 percent to private investors. For this year's recommendation, the ministry has endorsed full privatization. 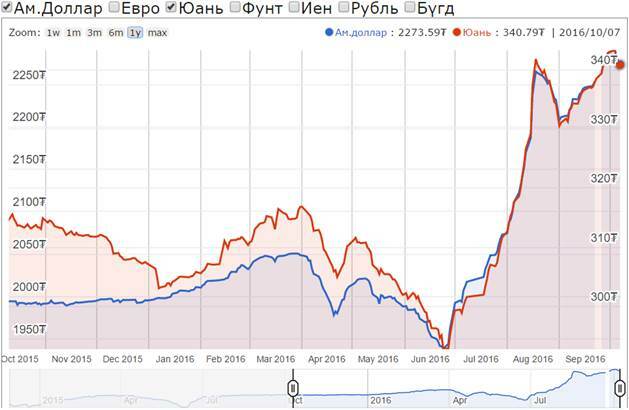 October 10 (Mongolian Economy) Deflation has taken over Mongolia. The consumer price index has been continuously falling for the past 24 months, as inflation was -0.2 nationwide and -0.6 percent in Ulaanbaatar in August, signalling that the economy is in dire straits. Deflation is caused due to two reasons: over supply of goods, or cash shortage in the market. Deflation and economic crises are closely related to each other. As deflation is much more worrying than inflation, central banks of countries try to overcome it as fast as possible. Though it may sound like deflation is not so bad, as price of goods go down, the revenues of companies will take a hit, and they will start to cut back on costs if this situation continues for long. In other words, companies will lay off employees and reduce salaries. Furthermore, companies will come to a standstill or even go bankrupt. Thus, unemployment will increase and purchasing power will decrease, perpetuating the vicious circle of deflation. The only way to get overcome this situation is to increase the money supply. However, the Bank of Mongolia (BoM) has significantly increased its policy interest rate by 4.5 percent to make it 15 percent, when in fact, they should have reduced the interest rate at a time when inflation has been falling for the 24 months. In order to make sense of this, monetary policy needs to be explained in a broader scope. Any economist will tell you that monetary counter-cyclical monetary policy is needed for Mongolia. In other words, central banks tighten the money supply when GDP growth is high in order to mitigate risks such as economic bubbles. Then, when growth slows down, they increase the money supply to support the economy. While the BoM should know best about implementing such policies, it does not seem like they do, which is drawing some attention. For example, the central bank increased money supply during the double-digit growth years of 2011, 2012 and 2014 and reduced it after those years when growth slowed. Personally, I do not understand why the central bank sharply increased its interest rate by 4.5 percent at a time of deflation and stagnating growth. The BoM explained that it increased its policy interest rate in order to stabilise the exchange rate. However, we need to take another look as to whether that is actually the main reason. It is true that the policy implemented by the central bank has stabilised the MNT exchange rate in the short term. However, it will clearly have a very negative impact on the business environment and economic growth in the medium and long term. Isn't the economic crisis the biggest issue for us? GDP growth, which was 17.3 percent in 2011, has continually fallen since then, dropping to 2.3 percent last year. 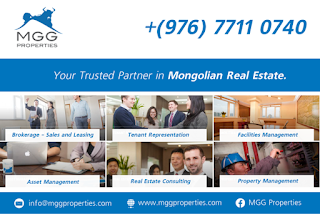 Forecasts by international organisations say that Mongolia's economy will see 0.5-2.7 percent growth this year. On one hand, foreign exchange flows have fallen due to reduced foreign direct investment and falling commodity prices on the global market. On the other hand, there is a shortage in state budget revenues due to the economic crisis, and government investment has significantly decreased. It is inevitable that there will be a shortage of money in the market with the BoM increasing its interest rate and tightening monetary policy. In August, M2 money supply decreased by 0.5 percent from July previous month. Furthermore, as a result of the BoM increasing its policy rate to 15 percent, commercial banks have also increased their loan interest rates to 19-20 percent annually. Loan growth is slowing and mostly showing negative indicators – banks are reluctant to provide new loans. Naturally, this is understandable. Providing loans to entrepreneurs entails high risks when non-performing loans are increasing during this economic crisis. Instead of lending, banks can just purchase the central bank bills that will pay 15 percent interest. There is no risk for commercial banks and is more profitable. However, it is business owners who are on the losing end. As a result, taking out a loan from commercial banks is becoming ever more difficult. Firstly, it is difficult to meet the high credit threshold. Secondly, it is difficult to pay the high interest rates. Taking out a loan with an annual interest rate of 20 percent is impossible at this time when we are experiencing deflation. Borrowers would have to sell their products at low prices after taking out a high-interest loan, when the people's purchasing power is further declining. As a result, companies earn less revenue and could even be on the path to bankruptcy further down the road. Unemployment and poverty will increase. In such conditions, falling into a very troubling economic crisis would be just a matter of rime. In order to avoid this, the central bank must loosen its monetary policy and supply the money the economy lacks. In general, countries try to encourage businesses and the real economy by using monetary policy during a recession. Increasing money supply supports an ailing economy. Yet, Mongolia is implementing a policy to further worsen the situation rather than helping. Hopefully, the BoM and the members of the Monetary Policy Council will take this issue into account in the upcoming meetings. · DBM, breaching law requirements, has lent 3 times to Erdenes Tavantolgoi company totaling US$250m. US$50m was repaid to DBM in GoM securities, however US$200m loan balance remains. Documents shown by Erdenes Tavantolgoi show that loan funds were accumulated in Human Development Fund. This breached recommendation of National Security Council that proceeds from Chinggis bonds should not be used on social transfers. 1. Erdenebilegism - 49 percent of "Erdenet"
October 10 (news.mn) The Mongolian parliament on Friday decided to skip its autumn break and continue its sessions to discuss budget stabilization measures and an economic rescue plan of the government. Initially, the parliament was to take a scheduled break next week until Oct. 19 due to the upcoming local council elections. However, top officials of the Mongolian government and the parliament decided that taking a break in the midst of an economic crisis is not appropriate. The website of the Mongolian state-run news agency "Montsame" posted a parliamentary schedule for the next week, which showed that the parliament will discuss the budget laws and measures to stabilize the 2017 budget. The Mongolian government said that it has finalized the economic rescue plan. The national security council composed of top officials including the president, prime minister and speaker of the parliament will review the plan and approve it, and then it will go to parliament. According to the Ministry of Finance, the 2017 budget deficit will be 2,589 billion tugrug or around 1.1 billion US dollars, nearly 9 percent of the land-locked country's GDP. It is planning to trim unnecessary government costs. Also the government proposed to reduce corporate tax for about 4,700 businesses working in four areas: food production, garment and textile production, construction materials production, agricultural farming and livestock animal farming. The move is aimed to create jobs and support small and medium-sized businesses. 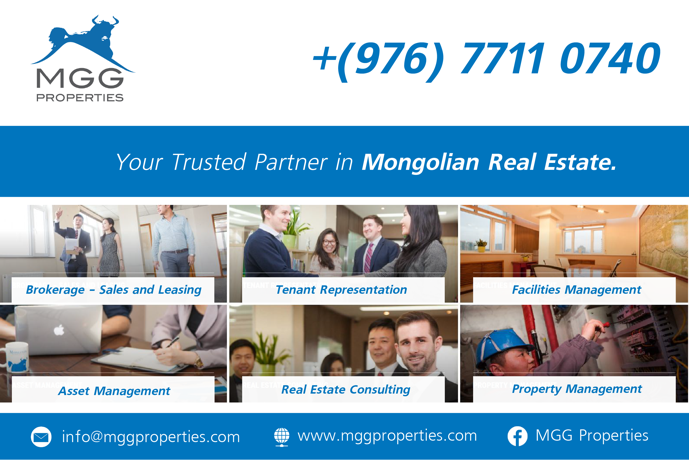 October 10 (news.mn) A proposal has been made by the Mongolian cabinet to the State Great Khural (parliament) to privatise some state owned entities, namely, Mongolian Stock Exchange, the Orgil Sanatorium Resort, the State Bank and the Mongol Post. "Mongolian Stock Exchange", a state owned share-holding company, will be privatised for MNT20 billion by the Ministry of Finance. According to evaluation from the first six months of the year, the company has been valued at MNT 5.45 billion. 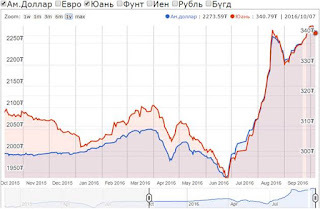 The "Mongolian Stock Exchange' operated a MNT 613 million loss during the first six month of 2016. The previous cabinet plans were that the company restructured a minimum of 34% of total shares under government and up to 66% of total shares to be offered to strategic and financial investors in several phases. According to the Deputy Minister of Finance, 70% of state owned companies are operating at a loss. Ulaanbaatar, October 10 (MONTSAME) Minister of Food, Agriculture and Light Industry P. Sergelen took part in the opening ceremony for "Golden Autumn 2016" fair in Moscow on October 5-7 at the invitation of the Russia Minister of Agriculture, Mr Alexander Tkachev. In the margin, the sides discussed about keeping on bringing virgin lands under cultivation and increasing the amount of meat export from Mongolia to Russia. The Russian side applauded Mongolia's new agricultural policies, and pledged close cooperation. Mr Tkachev accepted Mr Sergelen's invitation for a visit to Mongolia, and agreed to proceed the matter of boosting meat trade during his visit here. Directors of 20 land-farming companies are attending this agricultural exhibition, said the Minister to MONTSAME's correspondent in Moscow. According to him, the sides have agreed to introduce Russian agricultural technologies in Mongolia at the government level. October 10 (gogo.mn) Traffic, or congestion is occurred due to the traffic light regulation at the biggest intersections. Therefore, cars are allowed to turn right on red lights at West four intersection, East four intersection, Sapporo and Geser monastery intersections starting today with the aim to decrease the traffic. However, drivers must give way to pedestrians and vehicles on the opposite side crossing by green. Ulaanbaatar, October 10 (MONTSAME) On October 10, the three largest urban centers of Mongolia – Capital City Ulaanbaatar as well as Erdenet and Darkhan – joined the "Making Cities Resilient" campaign by the UN Office for Disaster Risk Reduction (UNISDR). Present were, Deputy PM U.Khurelsukh, Resident Coordinator of UNDP Beate Trankmann and other related officials. The campaign is now joined by 3,368 cities from the five continents. In past two years, over 6,600 accidents were reported in the capital city of Mongolia and more than 800 in Darkhan city and Orkhon province, which are 30 times more in Ulaanbaatar compared to that in other parts of the country, and twice in Darkhan-Uul and Orkhon provinces. Reducing risks of disasters, ensuring safety and building resilience to calamities and accidents in urban centers has become a significant matter for municipal and local administrations of Mongolia, where 80 percent of the total population live in the cities. Ulaanbaatar, October 10 (MONTSAME) The Tree-Planting Day has been marked biannualy since 2010, when President Ts.Elbegdorj issues a decree in order to raise public awareness of country's green growth. On Saturday, the President organized planting of 40 trees in the yard of Wedding Palace of Ulaanbaatar, in honor of the 40th anniversary of its founding. Symbolizing the ever-lasting love and commitment between married couples, the President planted evergreen spruces in the "Grove of Love". Alongside of him were some students from the general education schools of Ulaanbaatar and Erdenet, and the couple, who were having their marriage registered at the palace on October 8. During the course of the past six years, 9.8 million trees were planted at the national level, the survival and growth rate of the planted trees is 70 percent, which is an excellent performance, noted the President. President Ts.Elbegdorj and First Lady Kh.Bolormaa have got their marriage license 30 years ago at the Wedding Palace. Ulaanbaatar, October 10 (MONTSAME) Prime Minister J.Erdenebat will pay an official visit to Japan on October 12-15. He is to have official talks with his Japanese counterpart, Mr Shinzo Abe to conform the contents and line of actions, to be realized in frames of the Mongolia-Japan Strategic Partnership. The Premier will also pay courtesy calls on the Speaker of House of Representatives of the National Diet of Japan, Mr Tadori Oshima, and Speaker of House of Councillors, Mr Chuichi Date. Mr Erdenebat is set to attend the Mongolia-Japan Trade and Investment Forum to give insight into the investment environment and business opportunities in Mongolia. Ulaanbaatar, October 10 (MONTSAME) No saker falcon has exited Mongolia on commercial purposes since 2013, stated the Minister of Environment and Green Development, Ms D.Oyunkhorol at a press conference today in response to a statement made by the president of Mongolian Professional Hunters Association D.Khurtsgerel, who accused the Minister for smuggling the rare species of birds, on October 7. "Minister has no authority or whatsoever over exporting falcons. The Cabinet issued a resolution in 2013 banning the commercial export of saker falcons. The birds are gifted on some occasions to high-level guests from the Middle East. For security, all information regarding the arrival and departure dates and visit programs are classified, including the information on gifts. In 2016, four officials paid visits here from the Middle East. These guests were accompanied by 50-150 people. With the visits, the airport, hotel and other services made income of about MNT 15 billion only in August and September. The guests were imposed MNT 10 billion customs duty to carry each gift bird with them", she said. "On the other hand, great amount of investment was made in Mongolia from the Middle East within the past decade. For instance, USD 13 million in construction of Taishir Hydropower Plant, USD 3.4 million in establishment of Biodiversity Research Center, and USD 360 million in purchasing necessary medical equipment for the general hospitals of Khentii and Bayan-Olgii provinces. Middle Eastern investors have settled financing of USD 7 million for the project on Burn Treatment Center and USD 12 million for construction of Khentii airport. Therefore, a person cannot insinuate the high-ranking officials and investors on the basis of his own personal interests", the Minister underlined. According to the director of Environmental and Natural Resources Management Department of the Ministry, Mr D.Davaasamba, President of the Hunters' association D.Khurtsgerel submitted a proposal on exporting saker falcons, which was rejected by the Ministry. October 10 (Mongolian Economy) The third "Best Practices in Project Management" international conference, a two-day event organised by the Mongolian chapter of the Project Management Institute (PMI), was held at the Blue Sky Tower on October 7-8. The objective of the annual conference is to discuss and find resolutions on topics such as how to introduce international best practices in project management fitting for Mongolia's features; what should be done in order to improve the skills and capacity of organisations and experts engaged in project management; and how to develop professional project managers. The first day of the conference was as a meeting and the second day in the form of training, with about 300 foreign and Mongolian individuals in attendance. Participants attended speeches and workshops headed by the PMI's Board of Directors as well as project managers of major projects in Mongolia and Asia in areas such as construction and mining, non-mining and services and project financing. One of the most interesting parts of the events was the non-mining and services conference as the speeches and presentations about projects implemented in Mongolia such as the VAT rebate system, and projects implemented in the arts sector, in particular the film industry, piqued the interest of participants. This will be an event to unite Intelligence across functions, nations and sites - in the true ONE Intelligence spirit. Colleagues on all major sites will take part in this run at the same time … and be joined together in running for a good cause. For each km you will run/walked, Airbus DS Intelligence Company will donate money in support of Red Cross project in Mongolia via the Airbus Foundation. October 10 (Xinhua) The governments of China and Mongolia on Monday reached an agreement that obliges China to help Mongolia protect its rare Gobi bear from extinction by implementing a Gobi bear conservation project. The agreement, reached between and by China's Ministry of Commerce and the Ministry of Environment, Green Development and Tourism of Mongolia, aims to protect Gobi bears living in western Mongolia's Great Gobi conservation area, which is their only habitat on the earth. Speaking at the document signing ceremony, Batbayar Tserendorj, Vice Minister of Environment, Green Development and Tourism of Mongolia, stressed that Mongolia will fully support the Gobi bear protection project. Under the agreement, in the coming three years, the Chinese government will provide assistance in scientific research in Gobi bear's population and environment assessment, promoting the level of management of the Great Gobi conservation area, and providing necessary equipment and material supplies. Experts from the Chinese Academy of Forestry have spent eight days in collecting habitat area information and learning Gobi bear conservation practices through an on-the-spot investigation across the 18,000-square-kilometer core habitat of Gobi bear in the Great Gobi conservation area in Mongolia. Based on the on-the-spot investigation, after communication with Mongolian officials, the two sides reached consensus on Gobi bear's protection. Yang Qingdong, Minister Counsellor of the Chinese Embassy in Mongolia, said Chinese experts' arduous research efforts under tough conditions in the past few days contributed to the success of the agreement. Gobi bears, first found in the 1920s near Altai mountain range in western Mongolia, are listed as critically endangered in the Mongolian Redbook of Endangered Species and are on the verge of extinction because of global climate change. The Latest survey showed that there are only more than 20 Gobi bears left in the Great Gobi conservation area. October 10 (news.mn) Mongolian operatic baritone E.Amartuvshin will be a soloist in Giuseppe Verdi's opera Rigoletto at the Theater Kiel, in the capital of the German State of Schleswig-Holstein, tomorrow (11th of October). E.Amartuvshin was the finalist of 2015 "Cardiff Singer of the World". He has signed a contract with Theater Kiel as a soloist 15 times. He is first Mongolian opera singer to sign a year-long contract with a European theater. October 10 (gogo.mn) Mongolia has successfully hosted the "Face of Beauty International 2016" beauty pageant for the first time and Miss Russia was announced the winner. "Honestly, I have not imagined myself to become a winner. I have spent an amazing days in Mongolia and that would be my most memorable days of my life. It is not only that I have become the winner, I will not forget the every moment that I have spent here in Mongolia. Thank you Mongolia and thank you for all organizers and every person that helped me". The final contest has opened with the performance of "Khusugtun" band and international beauties danced Mongolian traditional dance. Top 15 Swimsuit Bodies: Republic Altai, Ecuador, Hungary, Moldova, Monaco, Mongolian, Myanmar, the Philippines, Russia, Zambia, Slovakia, Switzerland, Belgium, Kosovo, Paraguay. Miss Zambia wins the contest. The Mazaalai Ambassador award went to Miss Samao. During the final competition, Ukrainian Human Barbie, singer, model and actress Valeria Valeryevna Lukyanova performed her song. The Top 5 contestants were Miss Russia, Miss Mongolia, Miss Zambia, Miss Portugal and Miss Philippine. Every judges have asked the Top 5 contestants that what is beauty, what do you think about love, what is the meaning of the word "beauty will save the world", what would be your contribution to the Mazaalai, if you become winner.